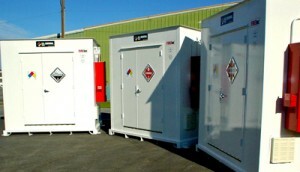 If you’re looking for chemical storage solutions, U.S. Chemical Storage is the most trusted name in the industry. Our dedicated and experienced engineers are devoted to helping you design a chemical storage building that suits your needs while maintaining the safest environment for your personnel. We also focus on compliance, so you can rest assured that your new chemical storage building meets federal, state, and local safety standards for any hazardous materials. When it comes to fire rated chemical storage, the options are endless – our fire rated chemical storage buildings are designed to mitigate fire hazards while offering increased protection to your facility, community, and environment. 2-Hour or 4-Hour Fire Rated Construction. This list is by no means exhaustive. Your fire rated chemical storage building can be fully customized, so you know you’re getting a quality product that is constructed by hand according to your specifications. Safe chemical storage starts with a compliant chemical storage building, but is only continued through good housekeeping. Keeping your fire rated chemical storage building clean and orderly can help you and your personnel maintain a safe environment by having all labels clearly visible, keeping aisles and exits clear of obstructions, and making leaks and spills easy to identify. Make sure you study your chemical’s material safety data sheet (MSDS) or safety data sheet (SDS) to ensure that you fully understand your chemical’s characteristics and hazards. This enables you to prevent hazardous situations, and allows you to prepare yourself and your personnel, should a hazardous situation occur.